Limerick registered their fourth consecutive league win with a 3-21 to 0-13 dismantling of Antrim in Cushendall. The Glensmen had been highly competitive in their three opening games but their wait for a victory goes on after being completely outplayed by the visitors, who will face Galway at Pearse Stadium next week with a place in Division 1A up for grabs. Antrim will play Dublin or Laois in the relegation play-off. Th hosts had an early let-off when full-forward Seamus Flanagan was upended in the square by Ryan Elliott but Aaron Gillane’s penalty rattled the crossbar. The sides were evenly matched for the first quarter, both keeping the scoreboard ticking over, but a monster point from Diamaid Byrnes from inside his own half was an ominous indication that Limerick were growing into the game. The Shannonsiders missed a second goal opportunity when Graeme Mulcahy’s shot was cleared off the line by Joe Maskey, but the breakthrough finally came for the visitors in the 30th minute as substitute Oisin O’Reilly surged through midfield and tapped home clinically for a four-point advantage. 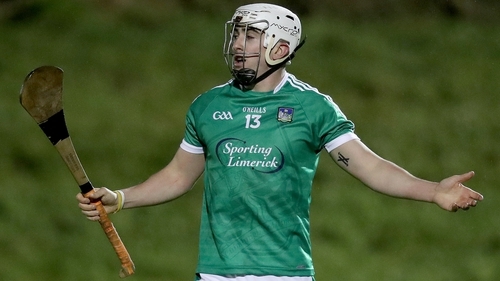 Bolstered by the goal they had threatened for so long, Limerick began to pull clear, points from Gillane, Barry O’Connell and Mulcahy giving them a double score cushion of 1-13 to 0-08 at the break. Limerick’s physicality and attacking prowess was underlined in the second half, with the rampant Gillane securing their second goal to put victory beyond doubt. Terence McNaughton’s charges had nothing to offer going forward, scoring just 5 points in the second half, and relying heavily on Neil McManus, who claimed nine of their 13 points. Limerick continued to be efficient up front without needing to be spectacular, Gillane, David Reidy, and Colin Ryan all adding to the tally in a fairly pedestrian second 35 minutes. The game was well and truly put to bed when Mulcahy drilled home from Paul Browne’s set up. The final margin of 17 poins is Antrim’s heaviest defeat by some distance in this campaign and, with both their ULand Na Piarsaigh contingents otherwise engaged, a hugely impressive statement from a supposedly second string Limerick team.